Food is top of the agenda for many of our couples, and rightly so – as big foodies ourselves, the trend for more innovative wedding food ideas is right up our street. Not only is it downright delicious, but at a wedding, food is what brings everyone together – the food choices you make can impact the whole atmosphere of your day, whether you fancy a more formal three course wedding breakfast banquet or to throw the rulebook out entirely and have something more casual or interactive. Either way, full glasses + full bellies = happy guests. Whichever style you choose to suit your day, here’s our roundup of the latest wedding food trends. Even if you want the traditional three course sit-down, post-ceremony canapes are an easy way to change things up without breaking from tradition entirely. 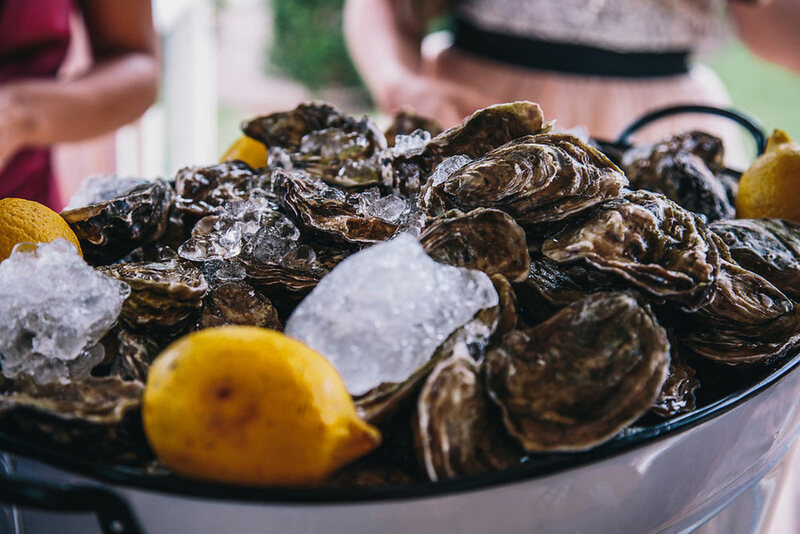 We love an oyster bar with champagne! Food and cocktail stations are becoming increasingly popular as couples embark on creating a more fun and relaxed approach to dining. With many couples now seeking a more ‘hands-on’ experience for their guests, interactive options such as build-your-own cocktail bars are a perfect solution (Aperol Spritz in the sun, anyone?). We’re big fans of a sharing platter, and these beauties from Essex-based Grape & Fig are no exception. Aside from creating a pretty stunning visual centrepiece in themselves, they are also a great way to get your guests mingling. Not only a great social option, they are perfect for fussy eaters, catering for everyone and giving people the flexibility to pick-and-choose what they want. 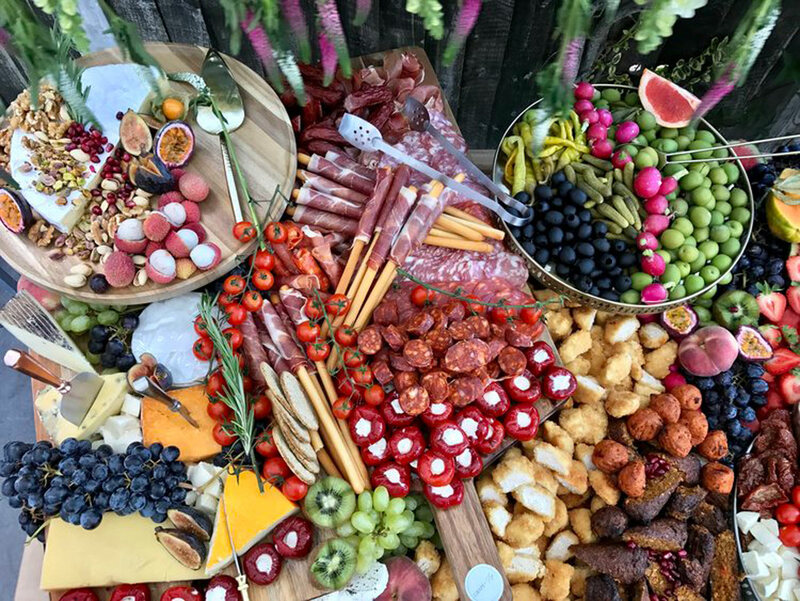 At Mirabella Weddings, we love laidback luxury vibes and these Australasian-inspired platters fit the bill perfectly. We’re seeing a big shift towards comfort food at weddings, and let’s face it, once the drinks are flowing, there’s nothing better than a comforting bowl of truffle mac & cheese, a posh pie and mash, or classic juicy burger from Cambridge favourites Steak & Honour. Whether for your main meal or post-dancing pick-me-up for your evening guests, street food trucks offer delicious food with a more informal vibe. 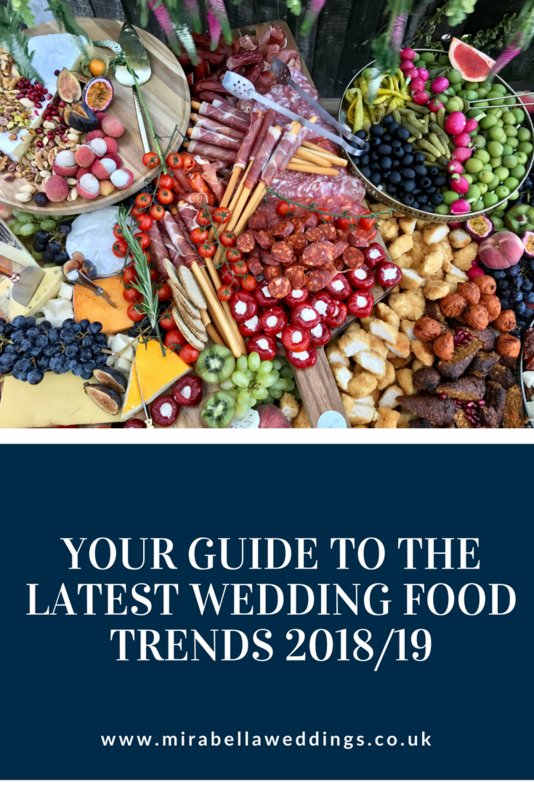 Whilst the wedding street food trend has been around for a little while now, it only continues to grow in popularity and is ALWAYS a hit with the guests. With a street food truck to cater for every palate, the only question is which to go for! By offering guests a selection, not only can you choose your favourite foods and personalise it to you, but it also means you can rest happy knowing that everyone will find something they like. 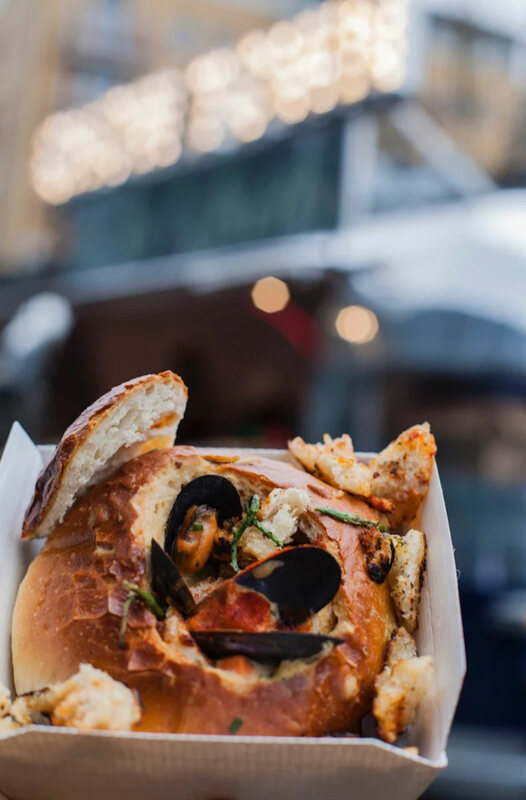 One of our new faves is the newly-launched Chowtown – serving up delicious seafood delights such as their hero Chowtown Chowder or scallop and bacon brioche bun from their stylish silver airstream trailer. In London, we’re surrounded by some of the world’s top chefs and their creativity in the food arena is increasingly filtering through to weddings. It’s not just about the food but about the show that comes with it. As they say, ‘we eat with our eyes’, and with this high-end food trend there’s nothing more true. A total experience for all the sensations, dazzle your guests with a theatrical food show, Heston-style. People are increasingly becoming much more adventurous with their menu choices and there’s a huge trend for immersive experiences that people can connect with. 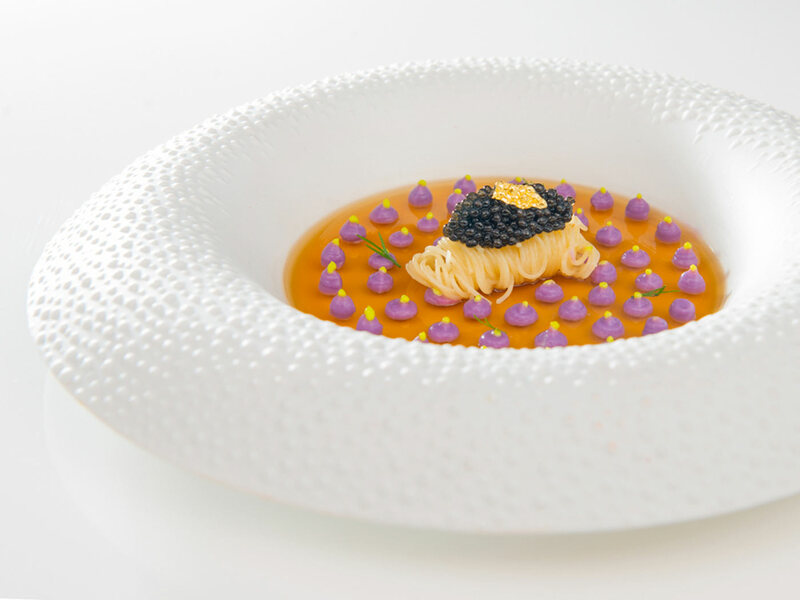 For a show-stopping experience to wow your guests, try Bubble Weddings – guaranteed to give your guests an unforgettable experience with the likes of this King Crab capellini with Oscietra caviar, purple cauliflower puree and gold leaf. These guys focus on experiences – creating scents, soundscapes, wind machines and visual triggers to deliver a truly memorable experience for you and your guests. If you’re after a slice of luxury and something unique, this is it. Across the board, we are seeing more couples making ethical decisions and ensuring food is locally sourced. 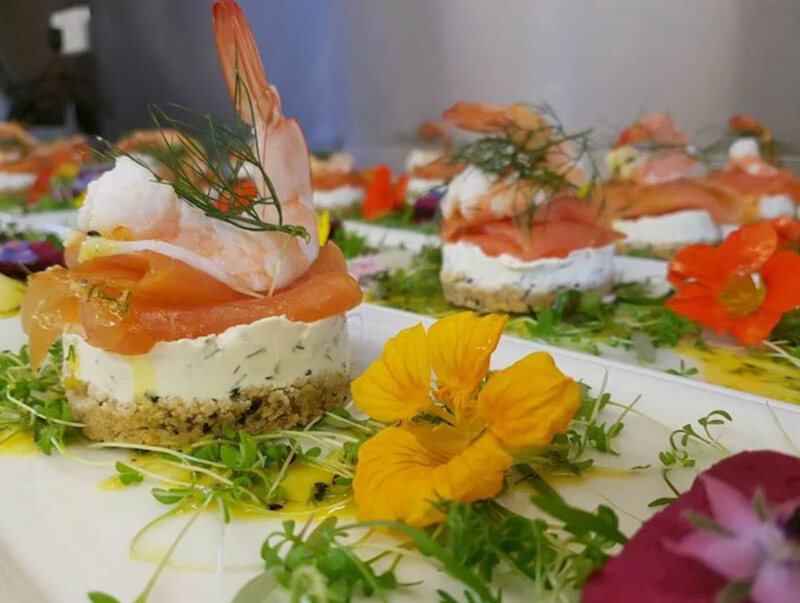 Venues such as South Farm in Hertfordshire specialise in growing the majority of their ingredients on site, ensuring the food is not only sustainable but tastes fresh and delicious too. Veganism is on the rise and interest in vegetarian and vegan wedding food is no different. Even for the non-veggies, seasonality is key, with spring vegetable options seeing a surge in popularity as a light and healthy summer alternative for canapes as well as the main event. Aside from the rise in vegan weddings, we are seeing more couples across the board making ethical decisions and wanting fresh, locally sourced ingredients. Whichever route you go down, the overriding trend this year is for personalisation, with couples increasingly opting for dishes that have personal significance to them. Food often comes attached with unique memories and so the more you can bring in your own experiences to the day, the more personal and memorable it will be to your guests. Whether you’re linking it back to a favourite childhood meal or something amazing you’ve tried on your travels, make this a part of the story of your day. Your wedding should be an amalgamation of all of your favourite things, and the food is no exception. If you want recommendations on the top suppliers who can help deliver your day, get in touch.